Intricate, enticingly contemporary and rhythmically complex; many parts come together harmoniously. 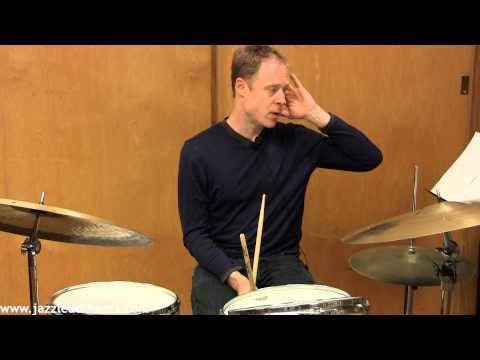 Drummer Bill Stewart talks about and demonstrates playing over the groove on Jon Gordon's Shape Up. This impressive piece is an intricate composition with modal elements. The different patterns in the rhythm section and melody layer upon each other to create a complex tapestry of textures that delight the ear. The solo section is over the Locrian mode in E. Our audio excerpt begins at the start of the recording with the bass and piano introduction; the melody enters after eight bars. All parts are 4 pages long. Along with many other great Jon Gordon originals, Shape Up comes from Jon's first album for the Double-Time label, "Currents." This was also the first album on which he used an instrumentation including both piano and guitar, subsequently used on other recordings. From Jon's notes regarding this title, we learn that this piece, along with Contemplation and Bloom is "based on the pitch cell D-E♭-F, through not strictly. They were written while studying with pianist/composer Jim McNeely. Shape Up was a challenging piece to play and record. The form is intro, A, B, C, blowing section (AB), second blowing section (D), to intro and A to end." One of the grooves Bill Stewart has become known for is this funky straight-eights groove demonstrated here. Through all the odd-time signatures and complex rhythms, he still gives this track a danceable quality. Even during his drum solo, the pulse and feeling of this song is never lost. This is one of the reason Bill Stewart has been one of the most in-demand drummers of this era. He allows music to dance, breathe, flow and move, all while throwing his signature sound on top of it. What better way to understand this than to jump into a transcription of it? This transcription is great for those interested in seamlessness flowing between odd-time signatures, as well as those interested in understanding the modern "straight-eighths" groove that many composers are writing. The drum solo provides a great example of how to solo over a vamp, going between complex solo ideas and simple groove ideas.